Electric vehicles are a tough sale as high prices keep customers away. The Chevrolet Volt is a plug-in hybrid electric vehicle, one that does not have the range restriction of pure EVs. Still, its steep sticker price has made the Volt a tough sell, something that GM hopes to overcome by offering incentives on 2012 and 2013 models. With a base price of $39,995, the Chevrolet Volt is priced more than twice as much as the Chevrolet Cruze, the model it shares its platform with. The Volt, however, comes with a $7,500 tax credit, effectively lowering that price to $32,495. That’s still about $15,000 more than the Cruze and higher than what some pure electric vehicles such as what the Mitsubishi i-MiEV cost. An earlier edition Chevrolet Volt. Earlier this week, GM announced that it was slapping incentives on the hood of every 2012 and 2013 Volt model. Buy a 2012 Chevrolet Volt and you get a $5,000 cash rebate. Choose the 2013 Volt and you get $4,000 cash back. Some states offer incentives too, which means your final cost for a Volt may drop down to just north of $25,000. This for a vehicle with an approximate 40-mile electric-only driving range; a 1.4-liter gas engine kicks in when the electricity has been depleted. GM’s move comes as its competitors drop prices on EVs as well. For instance, the five-passenger Nissan LEAF S can be had for as little as $21,300 when all tax savings are taken. Mitsubishi is currently offering a lease deal on the 2012 i-MiEV; a 2013 model has yet to be introduced. Honda has a special lease deal in place for its Fit EV and the Ford Focus Electric offers a similar deal. EV sales targets have missed the mark across all model lines. Expectations were heady more than three years ago just before the first models rolled out. Nissan has had to scale back its production plans even as LEAF production moved from Japan to Tennessee. GM had high hopes that the Volt would usher in a new era as buyers flocked to the thriftiest vehicles. Embracing green technology, however, comes at a steep price, what many financially pinched Americans have decided is not a priority. Although the Obama administration would love to see more EVs on the road, it is California that is pushing — even demanding — car manufacturers to fall in line. To keep selling cars in the Golden State, manufacturers must also offer an electric vehicle. So far, Hyundai has managed to skirt that ruling, but as its sales continue to rise it can no longer drive through that loophole. Indeed, the Hyundai BlueOn appears headed stateside, a vehicle the Korean manufacturer hoped it would not have to export. The company still expects to begin shipping its first hydrogen-powered fuel cell cars in 2015, a model that would meet California’s requirements. However, the Hyundai EV looks like a go, but it may lose its odd name before it hits our shores. 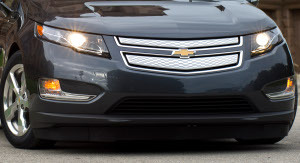 Even as GM has trouble selling its Chevrolet Volt, a second model will debut early in 2014. That model is the Cadillac ELR, a luxury coupe with chiseled features. Its price has not been announced, but likely it will sell for at least $60,000. That’s a price the well-heeled buyer can afford, but their willingness to buy one may not align with GM’s expectations. Photo courtesy of the General Motors Company.